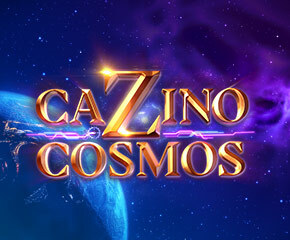 Cazino Cosmos is a new space-themed slot launched by Yggdrasil Gaming. It comes with five reels and twenty paylines. It can be played with a min and max bet of 10p to £20.00 for each spin on any desktop or mobile or tablet devices. This wonderful slot is a follow-up of its previous popular version Cazino Zeppelin slots. 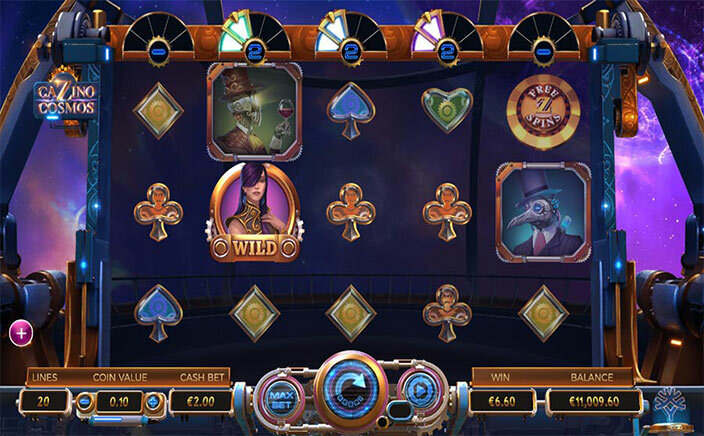 This slot is laid out in outer space where the players get a chance to join the formidable matriarch Stella who is on a mission to achieve cosmic wins. So help her out as you might get a share of her wins. Cazino Cosmos slot comes with four low-value icons and four premium icons which award prizes if more then 3 of them are placed in a perfect sequence on any payline. On the slot reels, the players will find spades, hearts, clubs and diamonds along with aliens Hatman, Wineman and Catman. The bearded general fella is one of most rewarding icon giving up to 200 times of stake if 5 of them land on a payline. Stella, a matriarch, depicts the wild icon and plays the crucial part, not only during free spins but also in the base round as well. Free Spins with Sticky Wilds – The Cazino Cosmos slot is a high volatility game which is all about bonus games. To gain the access, the players are required to land 3 or more scatters that will award up to 20 free spins. During this round, all wild icons appearing on a triggering spin will be carried over to free spins round and will become sticky. A similar thing goes for the additional wilds which land during the session. Now, if players land 1 wild on every reel, then the bonus round will get re-triggered, and five extra spins will be awarded. To make it more crispy, this slot adds a new feature with Collection free spins round. It gives an alternative way for triggering a bonus round with few significant benefits. Above every reel, players will view a collection meter. By landing five wilds on any single reel during any base game will initiate this Collection Free Spins round. This round functions in a manner similar to that of basic free spins except that it begins with the wild round or additional free spins. Wins are entirely dependent on which among the 5 meters is filled by them. Cazino Cosmos slot by Yggdrasil Gaming has various features. It’s fascinating graphics, lucrative animation, and synthesiser soundtrack makes it a pleasing game for the players. It has a reasonable RTP of 95-96%.